Total : 124 j. 23 h. 52 min. Temps à bord d'ISS ISS Expédition 31/32 122 j. 13 h. 02 min. Fiche biographique de RSC Energia. In 1983 he finished 10 classes of Moscow Secondary School No. 763. In 1989 Revin graduated from Moscow Institute of Electronics (MIE) specializing in Automatic Equipment and Electronies. Wife: Irina Alexandrovna Revina (Setyanova). From 1989 to 1993 he worked as an engineer of Research - and Production Association of Instrumentation (NPO IT) in Kaliningrad, Moscow Region. Since August 30, 1993 Revin worked as an engineer at NPO Energia. On February 9, 1996 by decision of Interdepartmental Commission (SIDC) he was recommended to be enlisted in the cosmonaut detachment of NPO Energia. On April 2, 1996 by Order of RSA General Director No. 42 he was enlisted in the cosmonaut detachment of NPO Energia as a test cosmonaut candidate. From June 1996 to March 1998 Revin passed general space training (GST) at CTC. On March 18, 1998 he passed the graduation examinations in general space training (GST) course. On May 20, 1998 by decision of the State Interdepartmental Commission he was recognized as fit for special trainings at CTC with no limitations. On June 17, 1988 by decision by the Interdepartmental Qualification Commission (IDQC) he was qualified as a test cosmonaut. From October 1998 to October 1999 he passed training in the cosmonaut team under the ISS program. At a period of January 16-27, 2007 in the forest 30 km from Moscow Revin participated in the survival training within the preliminary crew together with Charles Simoni (USA) and Oleg Artemiev. At a period of June 22-28, 2008 in Sevastopol (the Ukraine) he participated within the preliminary crew together with Oleg Novitskiy and Elena Serova in trainings in case of the descent vehicle water landing. At the meeting of the Interdepartmental Commission for selection of cosmonauts and their assignment to the manned vehicle and station crews on April 26, 2010 Revin was qualified as a cosmonaut of RSC Energia detachment. On August 2-5, 2010 he took part in trainings for visual-instrumental observations from board the plane in the vicinity of Severomorsk, Murmansk Region during which the tasks of the object observation and ecological monitoring were performed. For the execution of Roscosmos order to establish a single cosmonaut detachment Revin was discharged from RSC Energia. On January 22, 2011 by Order of CTC Head he was enlisted in CTC detachment as a test cosmonaut. 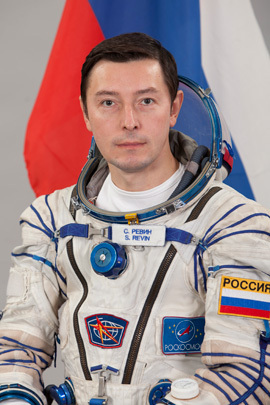 In Spring 2011 Revin was assigned to the backup crew of the Soyuz TMA-22 vehicle and prime crew of the Soyuz TMA-04M vehicle instead of Konstantin Valkov. On August 22, 2011 at the meeting of State Medical Commission (SMC) at Yu.A. Gagarin Cosmonaut Training Center he was recognized fit for a spaceflight as a flight engineer of the Soyuz TMA-22 vehicle backup crew. On September 1, 2011 at the Cosmonaut Training Center Revin together with Gennadiy Padalka and Joseph Acaba passed the examination training on the Soyuz TMA simulator. On September 2, 2011 the crew passed the preflight examination training on the ISS Russian Segment.